Despite their popularity, database benchmarks only highlight a small part of the capabilities of any given system. They do not necessarily highlight problematic components encountered in real life or provide hints for further research and engineering. 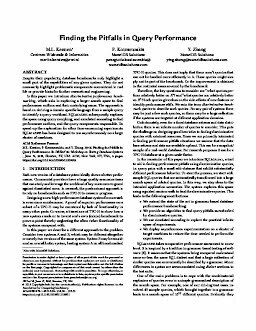 In this paper we introduce discriminative performance benchmarking, which aids in exploring a larger search space to find performance outliers and their underlying cause. The approach is based on deriving a domain specific language from a sample query to identify a query workload. SQLscalpel subsequently explores the space using query morphing, and simulated annealing to find performance outliers, and the query components responsible. To speedup the exploration for often time-consuming experiments SQLscalpel has been designed to run asynchronously on a large cluster of machines.